We strive to get as much information about storm shelters and tornado safe rooms to you as we can to help you make a more educated and informed decision. Therefore, we will be adding several videos in this Frequently Asked Storm Shelter Questions page over the coming weeks and months to help ensure you can get your questions answered in your own time, when you’re doing your research, without having to go anywhere or talk to anyone – or in the middle of the night if you like! If there’s other storm shelter information not found here or on any other page of the website that you feel is important and needs to be addressed, please CONTACT US by clicking on the CONTACT US link at the top of any page and let us know so we can answer the question on this page for the benefit of all either in text or if possible, via video. Q: Will the heavy concrete truck ruin my lawn or crack my driveway? A: For a safer, quicker, easier, simpler and all around better install, we now pour our concrete anchors ahead of time to create heavy large precast long blocks of concrete that we bring to the install location along with the shelter. These heavy precast concrete blocks achieve the same objective as the wet cement which is weight. This type of install requires a slightly wider but shallower hole but allows us to anchor the shelter tightly in place with stainless steel cable cinched down with our rubber-track mini-excavator to ensure it doesn’t float up or move once installed and anchored in place. Overall it’s a cleaner, faster, simpler install which doesn’t tear up your yard. Q: How large is the hole that has to be dug for the underground storm shelter installs? A: The size of the hole varies with the size of shelter installed. Most holes will be dug approximately 10 feet wide and as long as 10 to 13 feet with a depth ranging from 65 inches to as deep as 8 feet. However, once the shelter is installed all that you will see is the 3’x5′ or 3’x6′ shelter lid (and vents for the Refuge). Q: Which storm shelter is safer / better? A: All of our underground storm shelters and above-ground safe rooms have been tested by the Texas Tech University Wind Science Center to withstand an EF-5 tornado. They have been specifically designed and engineered to protect against tornadoes, the designs have been approved and stamped by the state and meet or exceed FEMA guidelines. They are all strong, safe, quality-made structures and each will protect you from severe weather and flying debris. Q: Will I get cell phone reception when inside one of your shelters or safe rooms? A: To the best of our knowledge, their is no noticeable loss of signal when inside a Lifesaver storm shelter, Refuge storm shelter or All Weather Safe Room. We suggest you bring your cell phone with you when seeking shelter from the storm in case of emergency (assuming the cell towers are still working). Q: What’s the best way to view one of the storm shelters or safe rooms? A: Unless it’s during storm season when we’re typically swamped with calls and have no inventory to show, we can schedule a viewing with you (depending on availability). During storm season however, most if not all storm shelters that we receive have already been ordered by customers waiting for their install. In either case, you should definitely watch the videos above to learn about what you need to know about your selected shelter location (or how to select an install location) and to see the different sizes and types of shelters and their benefits and features. 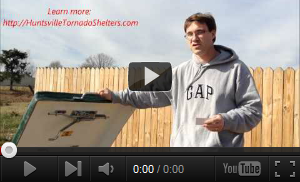 Q: I’m ready to place an order for a storm shelter or tornado safe room; what’s the next step? Thank you for your comments, we thought the video format might help more! Are Grants available for Storm Shelters? And where can i apply? Unfortunately at this time, we are not aware of any grants or funding for storm shelters. There was a program that the Alabama EMA ran through FEMA after the April 11, 2011 storms but that was limited to 100 people or so per county and closed within a few months. We do have financing options however. Just fill out the contact request and let us know which unit you’re looking to order and we’ll help line you up with financing. Thanks for stopping by!